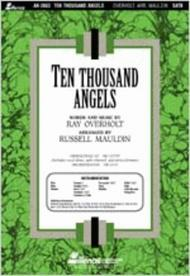 Ten Thousand Angels (Anthem) arranged by Russell Mauldin. For SATB choir with vocal solo. Anthems. Ideal for Easter, Lent or general uses.. Southern Gospel and Sacred. Octavo. 12 pages. Duration 4 minutes, 30 seconds. Published by Lillenas Publishing Company (LP.AN-2683).ISBN 9780834172180. Southern Gospel and Sacred.Touching and Inspirational! One of our best-loved gospel songs of years past, now in a heart-warming arrangement for choir. Begins with a sensitive solo in the first verse, then the choir takes over as the music builds to a power.